My boyfriend’s brother really loves to cook, but the only person in his family who likes salmon is their mom. As she doesn’t live here yet, I got to be the taste tester and sous chef when PO decided to try his hand at salmon pâté. Most of the recipes called for smoked salmon, or fresh salmon and liquid smoke, but PO wanted to poach the salmon with herbs to infuse the flavours. 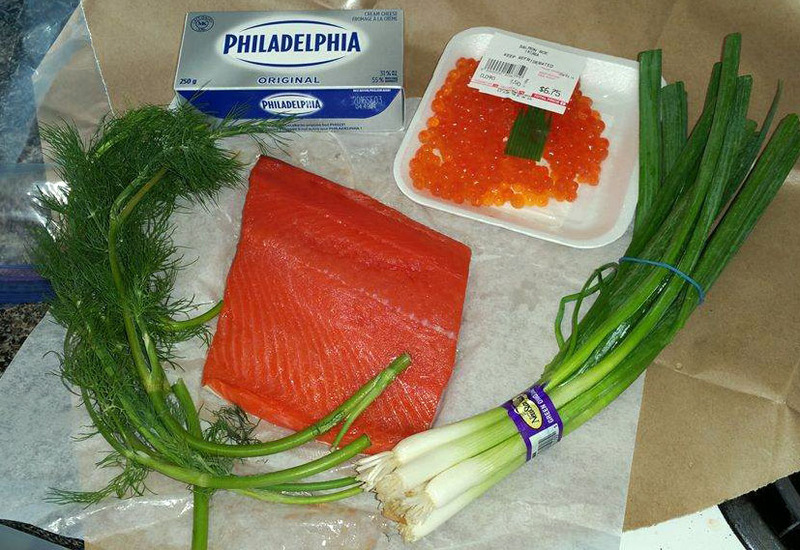 So first stop was the fishmonger—The Daily Catch on Commercial Drive—where we bought 300g of fresh sockeye salmon. Unfortunately the location we went to didn’t carry roe (only the downtown location does) so we swung over to an Asian supermarket the fishmonger recommended, Fujiya Japanese Foods. This unassuming building on the corner of two very busy streets was full of clean, well-organized aisles of tasty treats. A lot of the stock was obviously imported, but there was also a lot of fresh items, like sushi, pickles, and noodles. We then had to hunt around for a long while trying to find double cream (or even Devonshire cream) but everywhere was out of stock. PO uses double cream when making his liver pâté, so his first instinct was to use it for the salmon one too. While double cream is common in the UK, apparently there are no local producers. The problem was trying to find something with an equivalent milk fat (MF) content. Double cream has 48% MF; to compare, half-and-half (or cream) is 10% MF. Whipping cream has 33-36% MF, and heavy cream has 36% MF. So, none of our local options have a high enough fat content and apparently there was a shortage in Scotland so the recent shipment hadn’t come in. We decided to substitute cream cheese, which some recipes actually called for. Although it has a different consistency, cream cheese is 34% MF. Next time, it might be worth it to try using mascarpone cheese, which ranges from 60–75% MF, or trying to make our own clotted cream (aka Devonshire cream), which I’ve done before. 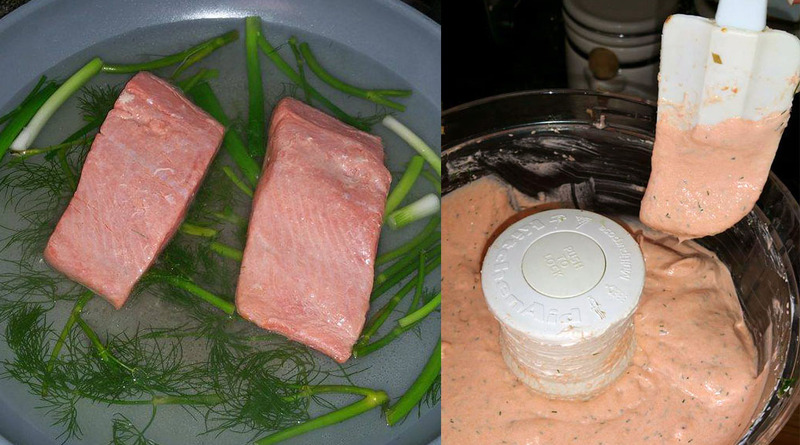 Once we got all the ingredients back to the house, we poached the salmon with some of the dill and chives, then tossed it in the food processor with the cream cheese and a few splashes of milk to thin it out. Once we got the right consistency, we put in the chopped dill and minced green onions to taste. We also added salt and pepper. To save, we spooned it into little ramkins and put it in the fridge to set. Once it was done, we topped it with the roe. To serve, we could either put it out with little crackers or toasties and a knife, or arrange it ourselves with little roe on each. For photographing purposes, we did the latter first. Combine the garlic salt, 3 Tbsp (45 mL) of lemon juice, and olive oil. Whisk the three ingredients together in a small bowl and transfer to a 4-litre resealable plastic bag. We used a big freezer Ziploc. Place the salmon in the marinade and seal the bag. Turn the bag several times to coat all sides of the salmon. Refrigerate for 30 minutes. Place the bag with the marinade and salmon fillets in the refrigerator for 30 minutes. Turn the bag at least once during marinating. Fill a saucepan with 2 cups (500 mL) of water, then add 3 whole green onion and 4 dill stems to the water. Bring the water to a gentle simmer over medium heat. 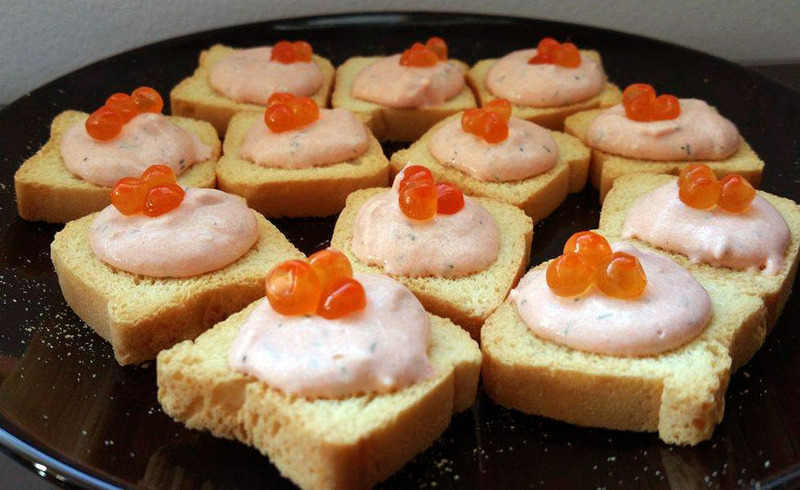 Place the salmon and cream cheese in a food processor. Start with the low option the move up to high until it has all broken up and mixed. Add 2 Tbsp of milk and process again letting it get smoother. Add 2 Tbsp of lemon juice, now process for a bit longer until it is as smoother as possible. Add the 3 chopped green onions and 3 stems of chopped dill. Process again until smooth and mixed. Add salt and pepper to taste. Process again until evenly mixed.